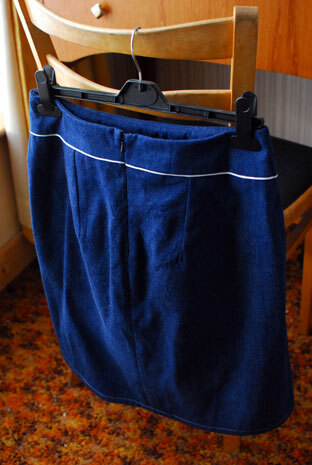 I think it’s fair to say that, with regard to sewing, I’ve had a good run of late. Sure, I’ve had a few blips but almost everything I’ve made in the last year, I wear regularly. Not this one. It’s the alternative view of the here – and wear it loads. I got some denim at the K&S show and thought it would be really nice for the other view. This was more tricky than the other view. There are many sections to the front and the piping needs to be very carefully applied. I took my time and was very pleased with how it turned out. The back, too, turned out very nicely and I’m happy with how the piping lined up. The problem lies with the pleat. It looks fine here but when on, it sticks out at the most ridiculous angle. No amount of pressing and re-pressing could get it to behave. I think it is a combination of the thickness of the hem and the fact that the pleat starts at the widest part of the skirt. Either way, it doesn’t work. 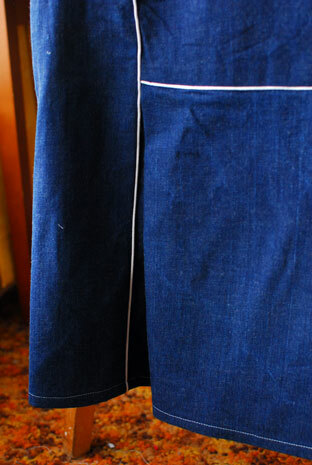 I have left it to one side but am considering redoing the hem in a way that will make it less thick. Sigh! Alb and I are in Galway this weekend. I had a really nice time mooching around town earlier. Whatever you’re up to this weekend, have a good one! The one thing I love about studying and working as an accompanist is the variety of work. For example, I’ve got competitions and concerts coming up for violin, flute, bassoon, choir, and singers. It sounds a bit much but really, it makes for an interesting working day and a decent amount of knitting time. The only problem I have found so far is that my available time to show things here has diminished. It’s not all bad because when I do get the chance to, I have lots to show. 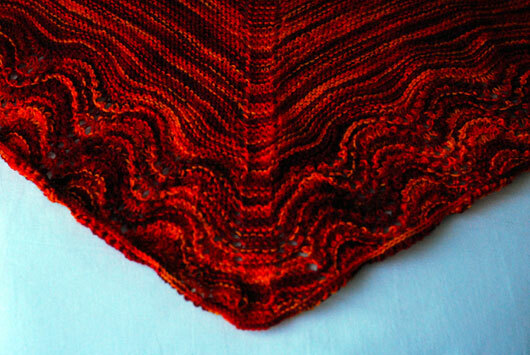 First up, there’s the Multnomah shawl which has been keeping me snug since. 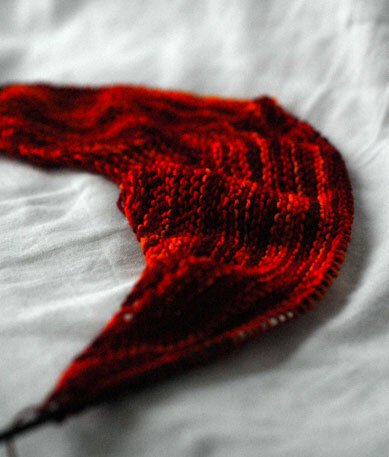 Pattern: Multnomah… there’s a link to the free pattern download on that page somewhere. Yarn: Wollmeise sock yarn that I got from Clare about a year ago. Yummy! 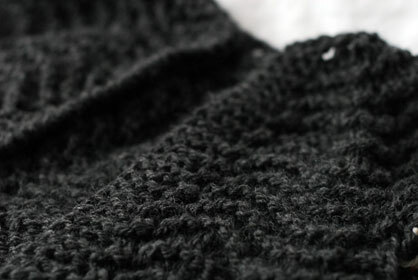 Modifications: I got a bit carried away with the garter stitch bit at the beginning and ended up with about a hundred extra stitches than I needed – about 350 if I remember correctly. Anyway, I took out the extra stitches at each edge and in the middle as specified in the pattern and then fiddled my numbers a bit to get a stitch count that worked with the stitch pattern. I fudged it a bit but the colours are so busy, you’d never tell. 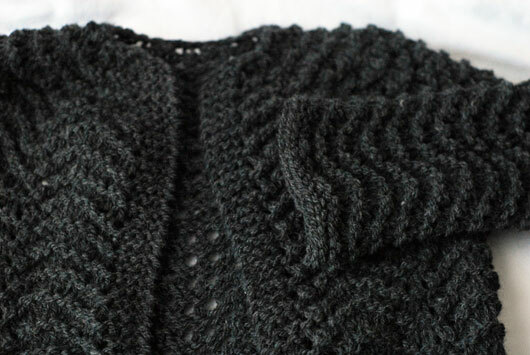 I love how the garter stitch runs right through the border pattern. It really shows off the colours of the yarn without pooling getting in the way. 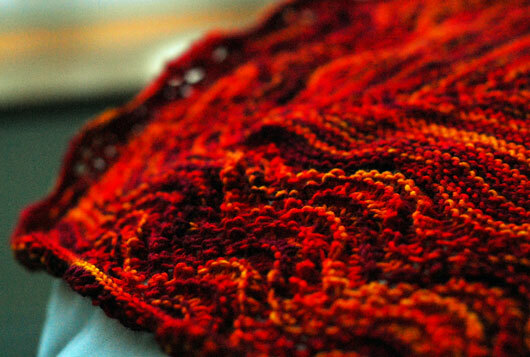 The other thing I love is how the feather-and-fan pattern affects the garter stitch body of the shawl. Kind of like a ripple effect. This was perfect mindless knitting and I will probably knit another again some time. Since I finished that up, I have been working on Liesl. I actually finished it off last night. I knitted the 34″ size because there’s no 36″ size offered in the pattern and most of the notes I read on Ravelry about it said that it stretched out when they blocked it. So, I knitted it about an inch shorter in the body and sleeves in the hope that this does happen. Even if it doesn’t, I have an extra ball of wool left over and it was knit from the top down so I can remedy if I need to. The only problem with finishing off fun, frivolous knits like those guys is that it’s back to the goat knitting. I am still cranking out that second sleeve. I am seriously beginning to think that the people who wrote about praying for strength and patience were definitely knitters. I seem to have broken the knitting jinx that has been upon me with the completion of my first goat (the second goat is nearly halfway there). While I was casting off the sleeve cap, I was filled with enlightenment (relief) and a voice said to me (Alb) to finish off the Fountain Pen shawl while I was at it (tidy up a bit). I haven’t blocked it out yet so the lace isn’t stretched to its full capacity. I think it is still pretty, though. Yarn: 1 skein of Malabrigo Merino Lace, picked up at Fadeninsel in Berlin. Needles: 3.25mm (I think) knitpicks. 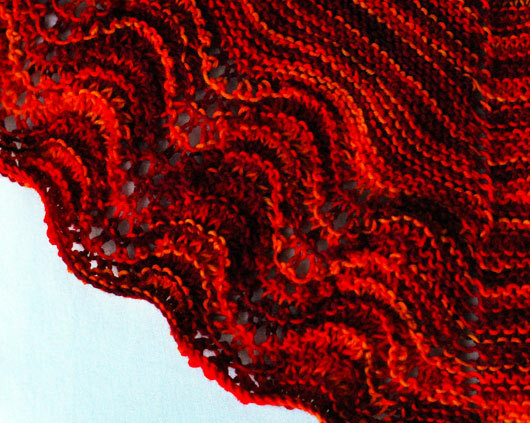 Modifications: Obviously the yardage of the Malabrigo isn’t nearly anything like the Helen’s Lace called for by the pattern so I cut down on the number of repeats of the main chart. I squeezed seven repeats out of it and had a little bit left over. Verdict: It’s a winner! The pattern was interesting enough to maintain my interest but still be easy enough to keep an eye on something else at the same time. 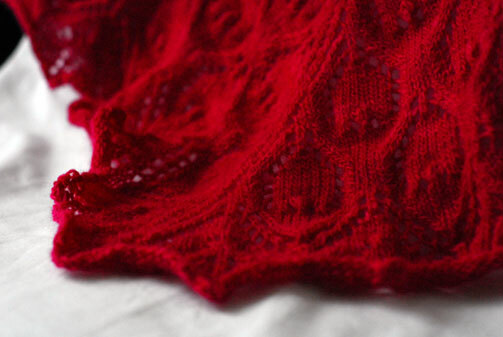 It’s up there with the Swallowtail Shawl in terms of prettiness and knitability. The yarn is gorgeous, very soft, and I think I will definitely be using it again for another project. 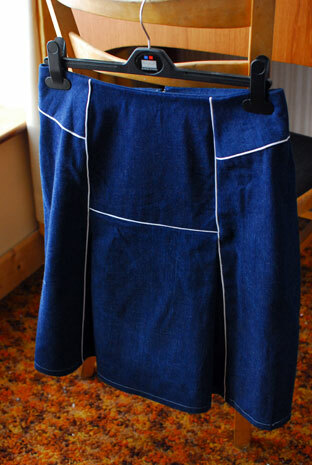 It is warm and lofty and would make a nice spring garment, I think. Anyway, so jubilant was my release from the knitting black hole within which I found myself, I have been casting on for new things left, right and centre! (And there are more over there, too). First up is Liesl. If it looks very small to you, that’s because it is! 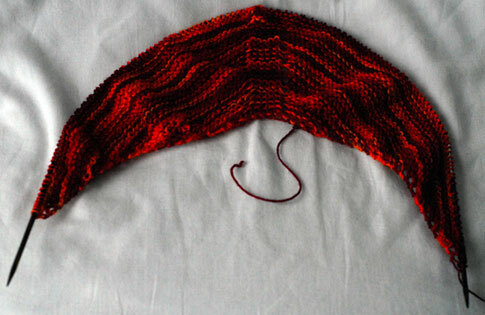 I got gauge but upon thought and research, decided to knit the 34″ size as opposed to the 38″ size (I would need a 36″ size) because most comments I read oscillated between “really wearable garment” and “stretches out like crazy when you block it”. I have tried it on a few times and am very happy with the fit under the arms and across the back. Obviously, it doesn’t meet at the front but recently I have found that more practical for me, as it is less restrictive when I play or practice. With this in mind, I haven’t knitted in any button holes. If it does stretch a lot when I block it and I find I do need buttons, what I might do is just crochet some loops on one side to accommodate a closure. 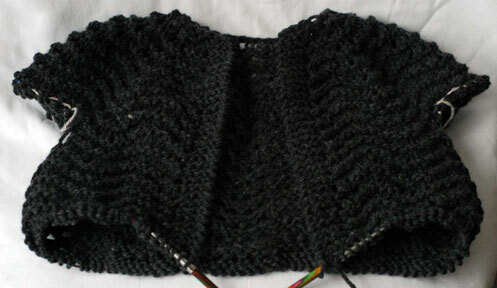 Either way, it is a ridiculously quick knit – I knit all that yesterday afternoon! I am also trying out a new yarn (to me, anyway). It is Garn Studio Alaska, a 100% wool aran weight yarn that I picked up from the Constant Knitter a while ago. I like it a lot. It’s got great bounce, stitch definition and yardage for the price (€2.50 for 75m). I have just started my fourth ball of eight so I’m hoping to get a decent length out of it! 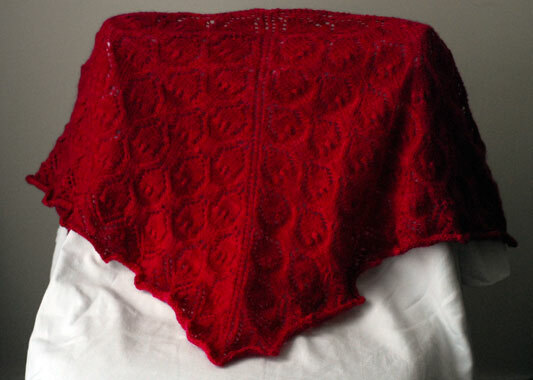 Of course, because I had just cast off a shawl, I had to start a new one… Actually, this one has been at the top of my wishlist for a few months now. 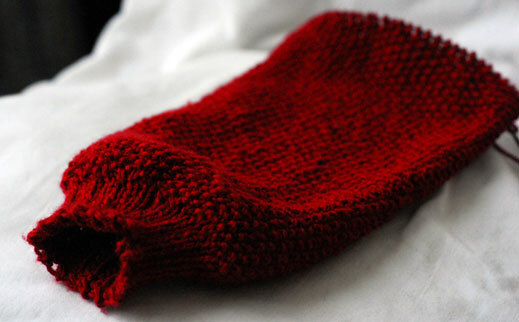 The pattern is free here and in my opinion, perfect for showing off those delicious hand-dyed skeins of sock yarn that are far too nice to be knit into socks. I had such a skein that I bought off Clare about this time last year. I love the colours but had a hard time coming up with a sock pattern that would do it justice. I think there really is something about garter stitch when it comes to self striping yarns.